Tata Motors Limited, is designed to increase the fuel efficiency of Tata trucks by 1.5 per cent (over SAE 15W40 engine oil of similar performance credentials) and save substantial amounts of diesel as well as operating costs. "Customer centricity is at the core of our business philosophy and we are therefore delighted that Castrol joined hands with us to develop a unique product to improve fuel efficiency, that can result in savings of fuel and cost for our customers as well as the commercial vehicle industry at large. Castrol RX Super Max is being launched at an opportune time when the commercial vehicle industry is facing serious challenges. I am confident that this product will be a huge success and will benefit truck drivers as well as operators," said Ravi Pisharody, ED, Commercial Vehicles, Tata Motors. 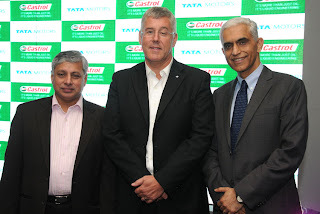 "Castrol and Tata Motors have a long and enduring partnership of over 30 years in India. Castrol RX Super Max Fuel Saver is an exciting new product which has been co-engineered with the objective of improving fuel efficiency and thus reducing the cost of operating a truck. The product has been developed and rigorously tested over four years in the laboratory and on the roads and will directly benefit Tata Motors customers. The challenge was to develop an oil which was fuel efficient but yet tough enough to withstand the huge pressure faced by trucks on difficult road and operating conditions including overloading. This is yet another step towards strengthening the close partnership we have with Tata Motors," added Ravi Kirpalani, Managing Director, Castrol India Limited.